One Mindfulness Practice You Can Try Today: Let It Go! Past hurts and emotional triggers have a way of keeping us stuck in our tracks. Practicing letting it all go helps us move forward. The observation that we aren’t the selves we think we are has been at the heart of mindfulness teaching for thousands of years. Whereas we tend to view ourselves as solid, fixed entities, under our central control, close investigation reveals no such thing that we can categorically call a self, at least in terms of an independent, unchanging identity. It’s not that we don’t exist, it’s that we don’t exist in the way we habitually imagine ourselves. 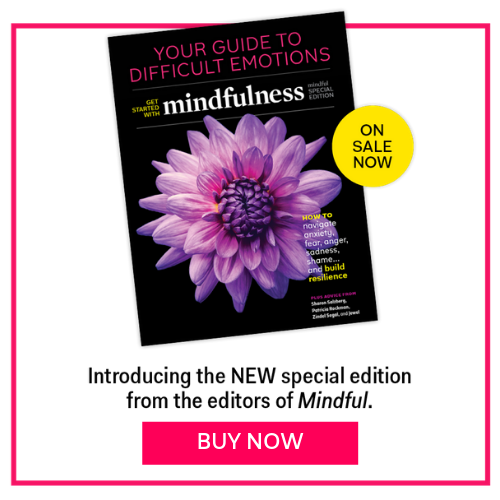 People often discover this on a mindfulness course when they realize that “thoughts aren’t facts.” Seeing that automatic (often negatively biased) thoughts arise in our minds all the time, without our conscious say-so, we start to see how what we call “me”/”I” is more a bundle of tendencies, some more and some less under our direction. All these tendencies are continually in process, subtly shifting form all the time. If we can accept that we’re not single, independent, fixed selves, what are the implications? First of all, it means that we aren’t in complete control—no matter how hard we try, we can’t command our bodies not to age or get sick, and we can’t just decide to be happy in any circumstances, or prevent unbidden thoughts or sensations. We’re not in charge of our environment either: From unpleasant weather to people we find difficult, there are aspects of our world, internal and external, that we’re not empowered to alter. By accepting this, we can stop some of our struggle with the inevitable parts of life that we don’t much like. We can stop taking them so personally. No matter what’s going on right now, pleasant or unpleasant, we can be sure it’s on its way to becoming something else. It’s also an opportunity for compassion: We can recognize that we aren’t solely responsible for our thoughts, feelings, and behavior, which are each the result of many and myriad causes and conditions in our bodies, brains, minds, and environment. We can let ourselves off the hook, recognizing that the situations in our life haven’t always been freely and fully chosen. We can soften to ourselves, and, seeing that the same is true for others, we can soften to them too, even when they do things we don’t like or agree with. At the same time, we can recognize that we’re not completely stuck. If we’re a range of changing processes rather than a single, solid entity, then just because things are tough doesn’t mean we’re fundamentally broken. No matter what our problems, there’s room for manoeuvre. Our brains can change, our bodies can change, our minds can change, and our lives can change. No matter what’s going on right now, pleasant or unpleasant, we can be sure it’s on its way to becoming something else. Accepting that situations aren’t as simple or as stuck as we imagine can make them feel more workable, even in the midst of great challenge. By appreciating there are many aspects to any circumstance, we can start to see where the wiggle-room lies—where we have some agency to effect skilful changes. We can also better see when to let things lie. By tapping into awareness—recognizing where the choice points lie—we can use our energy effectively. Accepting that situations aren’t as simple or as stuck as we imagine can make them feel more workable, even in the midst of great challenge. Solidifying our moment-by-moment experience into “selfhood” is a powerful habit—it’s not easy to see through it, and it’s an aspect of mindfulness that often gets left out, perhaps as being too hard to comprehend or too challenging. However, traditionally, it’s also the key to liberation from stress, which is why I included a chapter on it in Mindfulness: How To Live Well By Paying Attention (from which some of this blog is adapted).